Arrangement of Communal Meal (Dharm Yagya) by Supreme God Kabir in Kashi City. Sheikh Taqi was the chief of all the Muslims i.e. he was the Chief Pir who was already jealous of Supreme God Kabir. All the Brahmins, Mullahs and Qajis, and Sheikh Taqi held a meeting and conspired that Kabir is a poor man. Send letters by his name that Kabir Ji is a big businessman in Kashi. His full address is Kabir S/o Noor Ali Ansaari, Colony of Weavers, Kashi City. Kabir Ji will organise a three-day long religious communal meal. All the sadhus and saints are invited. He will daily give a gift of one Dohar (the most expensive blanket of that time) and one Mohar (a circular 10 gram mohar made of gold) to everyone who will consume food. No matter how many times a person consumes food in a day, each time Kabir will give one Dohar and one Mohar to that person daily. Laddoo, Jalebi, Halwa, Kheer, Dahi Badey, Maal Poode, Rasgulle etc all sweets will be available in the food. Even dry material (flour, rice, lentils etc uncooked dry material, ghee and sugar) will also be given. Sheikh Taqi even got one letter delivered addressed to himself and Badshah Sikandar Lodhi. On the night before the scheduled day, sadhus and saints started gathering. The communal meal had to take place the next day. Saint Ravidas told Supreme God Kabir that – ‘Approximately 18 lakh sadhus, saints and devotees have arrived in Kashi with a letter by your name. They have all been invited to eat a communal meal. Kabir Ji, now we will have to leave Kashi and go somewhere else.’ Kabir Ji knew everything, but he was still acting. He said, “Ravidas ji, sit inside the hut, and put the door-chain on and lock the door. They will themselves return after wasting their time. We will not go outside at all.” Supreme God Kabir reached His capital Satyalok. Loading bags, like on donkeys, of all the cooked material and dry material (rice, flour, sugar, khaand=unrefined sugar, lentils, ghee etc) on nine lakh oxes, he descended from there to earth. Even the attendants came from Satyalok itself. Supreme God Kabir Himself acquired the form of a ‘Banjara’ and told his name as Keshav. Sikander Badshah of Delhi and his religious Pir Sheikh Taqi also came. A communal meal was going on in Kashi. Everybody was being given one Dohar and one gold Mohar (10 gram) as donation. Some dishonest saints, by consuming food four times in a day, were taking dohar and mohar all four times. Some were also taking uncooked dry material (rice, sugar, ghee, lentils, flour etc). On seeing all this, Sheikh Taqi made a long face. He went with King Sikander Lodhi to that tent where Kabir Ji Himself disguising as a Banjara (the merchants of that time were called banjaras) was sitting by the name Keshav. King Sikander Lodhi asked, “Who are you? What is your name? How are you related to Kabir Ji?” God seated in Keshav form said, “My name is Keshav. I am a merchant. Kabir Ji is my childhood friend. I had received a letter from him that a small communal meal has to be organised; bring some material with you. Obeying his order, his servant is present here. The communal meal is going on.” Sheikh Taqi became frightened and sat down on the floor when he heard that ‘a small communal meal has to be organised’ where 18 lakh people have come to have food! Everybody is also being given a dohar, a mohar and dry material like flour, lentils, rice, ghee and sugar. They are calling this a small communal meal! But burning in the fire of jealousy, he went to the rest house where the king was staying. Sikander Lodhi asked Keshav, “Why has Kabir Ji not come?” Keshav replied, “His slave is sitting here. There is no need for him to bother himself. Whenever he will wish, he will come. This communal meal has to go on for three days.” Sitting on an elephant, Sikander Lodhi went with his bodyguards to Kabir Ji’s hut. Dismounting the elephant, the King knocked on the door. He said, “Parvardigar! Open the door. Your child Sikander has come.” Supreme God Kabir said, “O King! Some people are troubling me. They cause trouble by planning a new conspiracy every day. Today they have called millions of people by posting a fake letter. I, a poor weaver, am sustaining my family by weaving clothes. I do not have money to arrange a communal meal or to give any donation. I will quit this Kashi City with my family tonight and go to a far-off place. I will not open the door.” King Sikander said, “O Omnipotent Allah! I have recognised you. You cannot befool me. What a communal meal you have organised on the open place of Chaupad! Your friend Keshav has come. He has brought unlimited edible material. Millions of people on consuming food are hailing you. They want to have a sight of you. Please open the door once and grant your sight to your slave Sikander.” Kabir Ji said to Sant Ravidas, “Open the door.” As soon as the door opened, King Sikander took his shoes off and prostrated along with his crown. Then he requested Kabir Ji to come to the communal meal going on in Kashi. When God Kabir came out of the hut, a beautiful crown came from the sky and adorned the head of God Kabir ji, and fragrant flowers started showering from the sky. The king requested Supreme God Kabir Ji to mount the elephant. Kabir Ji took Ravidas ji along with him. The three, the King, Ravidas ji and God Kabir Ji, mounting the elephant arrived at the place of the communal meal. They introduced Merchant Kabir to everyone. Himself playing the double role as Keshav, God Kabir Ji delivered spiritual discourse through questions and answers to the saints and devotees present there, that went on for 24 hours. Several millions of saints renouncing their wrong way of worship took initiation from Kabir Ji and got their welfare done. After the completion of the communal meal, when all the attendants, loading the residual material and tents on the oxes, were about to leave, at that time King Sikander Lodhi, Sheikh Taqi, Keshav and Kabir Ji were all standing at one place. All the oxes, and the attendants, who were in the attire of nomads, crossed Ganga and went away. After some time, King Sikander Lodhi said to Keshav, “You may go; your oxes and companions are going. When the king looked in the direction in which the oxes and the nomads had gone, there was no one there. Astounded, the King asked, “Kabir Ji! Where have those oxes and nomads gone so quickly? At that very moment, Keshav also merged into Supreme God Kabir’s body. Only Kabir ji was standing. Understanding the entire mystery, King Sikander Lodhi said, “Kabir Ji! All this was your divine play. You are yourself God. The fire of jealousy engulfed Sheikh Taqi’s body and mind. He said, “We can organise hundreds of such communal meals. What sort of a communal meal was this? It was a ‘Mahochha’. Gist: - Kabir Ji has given an example to the devotees that if you will do bhakti like me with a true heart and lead your life honestly, then God will help you like this. 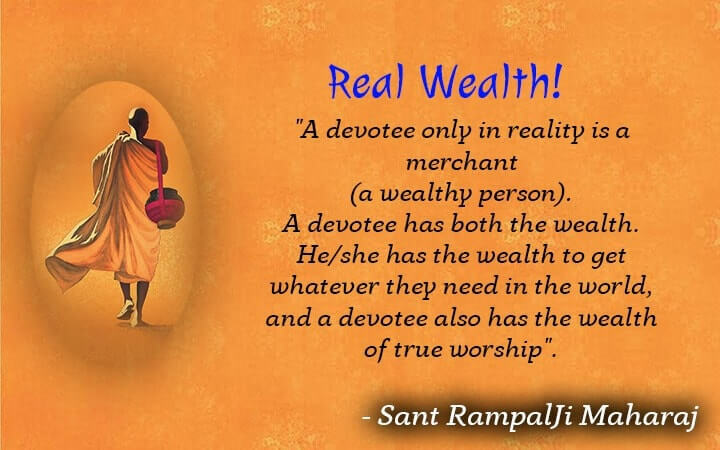 A devotee only in reality is a merchant i.e. a wealthy person. A devotee has both the wealth. He/she has the wealth to get whatever they need in the world, and a devotee also has the wealth of true worship.